Have you noticed that your old cat has been drinking water more than usual lately? Has he been repeatedly going to his water bowl? Do you have to refill his water bowl more often? Have you observed him drinking from water sources he doesn’t drink from before like the toilet bowl, puddles, a dripping faucet or shower? 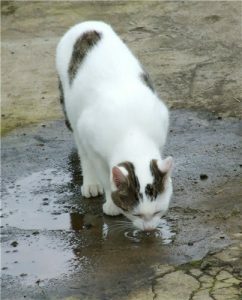 A cat that is drinking water excessively especially from unusual sources, like this puddle, is a cause for concern. 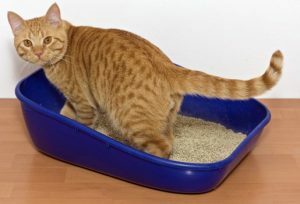 Have you also noticed that he has he been using the litterbox and urinating more frequently? Have you observed more wet patches in the litter than normal? Has kitty been urinating outside the litterbox and in inappropriate places? Frequent trips to the litterbox is also a warning sign that something is wrong. The average amount of water a cat needs daily is 50-60ml/kg bodyweight/day. This amount varies from day to day and between individual cats in relation to several factors like the cat’s activity level, diet, physiological status and the environmental temperature. The reason for increased water intake is thirst. When the cat has been engaged in strenuous physical activity, eating dry food or food with high salt content, lactating, and when the environment is hot and the cat is panting, it is normal that the cat will experience increased thirst and will drink more. An abnormal increase in thirst and subsequent increase in water consumption is called polydipsia (PD). The production of abnormally large volume of dilute urine is called polyuria (PU). These two always go together. While we may ordinarily think that an increase in the amount of urine production is a result of drinking more water, it is more commonly the other way around — drinking more water is a compensatory sign that develops subsequent to increased loss of body water through increased urine production. This is why the condition is called polyuria with polydipsia (PU/PD). 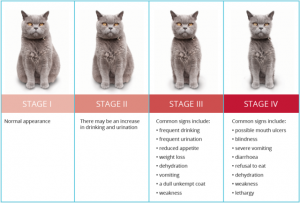 Increase in an old cat’s drinking and urine production is often an early indication of several age-related diseases. PU/PD often presents with other associated symptoms that can help differentiate the cause why the cat is drinking more water. Observe for changes in appetite, weight loss, changes in activity level and sleeping pattern, vomiting, diarrhea and dehydration. Your observations can be very valuable to your veterinarian in diagnosing the cause of the excessive drinking. 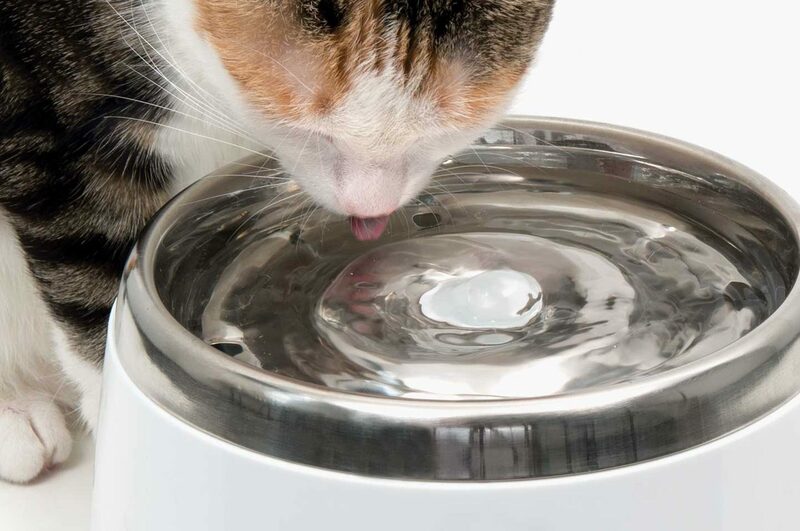 What are the causes of increased water consumption in older cats? The three most common conditions are kidney disease, diabetes mellitus and hyperthyroidism. 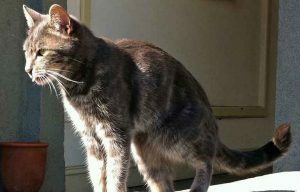 Kidney disease and failure is common in older cats. Kidneys can become diseased due to infections, tumors, exposure to toxins or due to immune-mediated conditions. Liver problems can also lead to kidney damage. Some specific conditions like Fanconi syndrome result to functional abnormality of the kidneys. When the kidneys are not functioning properly, they fail to reabsorb water and loses it in excessive amounts in urine. Prolonged polyuria can result in a condition called renal medullary washout. This is a syndrome wherein due to excessive loss of water in the urine, there is also excessive loss of sodium and chloride in the renal medulla part of the kidneys. This aggravates the problem because it makes the kidneys even more unable to concentrate the urine and intensifies the already existing polyuria. The reaction is then a compensatory polydipsia wherein you will see your cat drinking excessive amounts of water. Symptoms in the different stages of kidney disease. Polydipsia due to renal disease is usually accompanied by progressive weight loss in the earlier stages. The kidneys are notorious in the sense that almost 75% of the kidneys can already be damaged before alarming clinical signs are seen. So careful observation of any changes in eating, drinking and elimination habits of the cat is very important to catch kidney disease as early as possible. Other later signs of kidney disease include vomiting, bad breath, sores in mouth, dehydration, and seizures due to accumulated toxins in the blood. Diabetes mellitus is also common in older cats. In this disease, the body either does not produce enough of the hormone insulin or the cells are resistant to insulin. The result is a very high amount of sugar in the blood. The kidneys will attempt to remove the excess sugar from the body through excretion in the urine. But where sugar goes, water will follow to dilute the sugar. This results in polyuria and compensatory polydipsia. Kitty will pee more and drink more. Diabetic cats usually have increased appetite but progressively losing weight and have low energy levels. A diabetic cat seems always hungry but is losing weight. He is also drinking water and urinating excessively. The thyroid glands control the body’s metabolism. When the thyroids are hyperactive, the metabolic rate increases. The heart rate will increase resulting to increase in blood circulation. It also results to increased urine production in the kidneys. The cat will urinate larger amounts of urine and experience more thirst and will drink more. Other associated signs include a voracious appetite but with progressive weight loss. Cats also exhibit nervousness, anxiety and may vocalize excessively. Diabetes insipidus is a condition wherein there is a lack of the Antidiuretic Hormone (ADH) or the kidneys do not respond to ADH. The result is the kidneys cannot conserve water, produces large amounts of dilute urine and increased thirst and drinking. Others conditions, although less commonly, include heart disease, tumors, hormonal problems, infection, hyperadrenocorticism, hypercalcemic nephropathy and deposition of immune complexes in the kidneys. Then there is what is called “drug induced polyuria”. Medicines for treatment of diseases, for example, glucocorticoids, mannitol, furosemide, phenytoin can cause increase urine production and urination. Even too much of supplemental dextrose and Vitamin D can cause polyuria and polydipsia. What should I do when my old cat is drinking a lot of water? Sometimes, observation of the cat’s water intake by the owner is subjective. A visit to the veterinarian will be necessary for an actual measurement of your cat’s 24-hour urinary output and water intake. The veterinarian will also need to take a complete history, perform a physical examination and recommend laboratory tests. 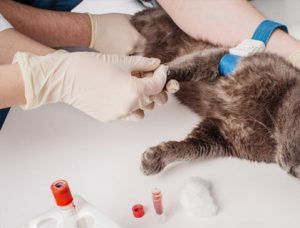 Blood and urine tests will need to be done to correctly diagnose which of the above-mentioned conditions are causing your cat to drink excessively. The veterinarian may also need to take abdominal X-rays or perform other more specific tests to identify the problem. A blood test at the veterinarian’s office can help identify the cause of excessive drinking. During the visit the veterinarian can also give you instructions how to keep your cat comfortable at home. Some cats need to be given subcutaneous fluids at home and your veterinarian can teach you how to properly do that. As cats grow older and reach their senior years, a regular annual or bi-annual wellness check is very beneficial to be able to identify ageing-related health problems as early as possible.